As we have seen in the other topic Geothermal Energy: History, types and uses, Geothermal is combination of two Greek words- geo meaning earth and therme meaning heat. The terms means the energy derived from the heat of the earth. This source of energy is not a recently discovered phenomenon. It was used by our ancestors since 10,000 years- when the Paleo Indian settled near hot springs and used the hot water for bathing, heat and medicinal purposes. 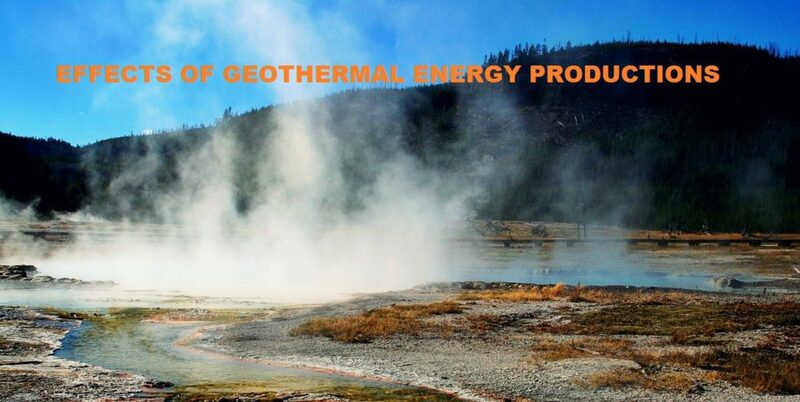 Here, we do concentrate on the effects of the production of geothermal energy. We will look into the positive as well as negative aspects of the effects. The sources of geothermal heat are the earth’s superheated water and rock- shallow surface pools, hot water, steam and rock deep below the earth’s surface and hot molten rock called magma. Currently the only commercially viable source is the hydrothermal resource. These sources are often located on the tectonic plate boundaries, where the earth’s crust is in always interacting with the mantle below. The Pacific Ring of Fire and East Africa’s Rift Valley are such areas. The hot spots in the US are found in California, Alaska, Oregon and Nevada. According to one assessment 9 western states have the potential to provide over 20 per cent of the nation’s electricity needs. Unlike solar and wind resources, which are more dependent upon weather fluctuations and climate changes, geothermal resources are available 24 hours a day, 7 days a week. If it is managed correctly this is a sustainable resource. There are advantages and disadvantages associated with geothermal energy. Its advantages are that it is clean, renewable, and easily available. Most of the disadvantages lie in its exploration and plant building stages. As more research is done and development occurs in processing and pollution control technology, these have to be implemented in existing geothermal plants. Though the benefits of doing this are great, the financial cost is quite high. Incentives and tax deductions will encourage the companies to add this kind of value to their product. Water vapour is the main constituent in the plumes arising from geothermal plants. Hydrogen sulphide H2S is released while using geothermal energy. Its emissions have been reduced or abated at the plants. 99.9 percentages of H2S is now converted to elemental sulphur which is then used as a soil and fertiliser feedstock. Where there is no measure to control the H2S emission, it results in foul smell and forms acid rain causing pollution for local population. Toxic elements such as Radon, Mercury, Arsenic, ammonia and Boron emissions are also seen. These can be abated by more than 90% at the plants themselves. All geothermal sources do not contain mercury. The facilities at The Geysers in California, are assessed under the strict California regulations and levels of Mercury released here is not considered harmful to human health. Compared to coal and natural gas plants the emissions of greenhouses gases is almost negligible. Disadvantages- Studies show that excessive water vapour in localised areas has a deleterious effect on the local flora and fauna, especially as the ecosystems are very sensitive in these regions that are being tapped for geothermal energy. Local weather changes can be caused by emission of steam affecting clouds. When the technology to filter toxic elements such as mercury, radon and boron are not upgraded, this will lead to the pollution of air and soil. Releasing Hydrogen sulphide into the air causes foul odour in the vicinity of the plant and also Acid rain which affects the sensitive species and causes endangerment. Disadvantage-But there is a lot of noisy drilling in the exploration phase, which can cross the pain threshold of 120 decibels. During production this comes to 90 dB that is still heard over some distance. It can be a disturbance in tourist sites and local recreation. Water is the main carrier for heat energy used in the plant. Water that is drawn from the resource is usual injected back into the geothermal reservoir. They are not released into the surface water systems. This helps to maintain the sustainability of the reservoir. Wells with thick casing prevents the pollution of the local ground water systems. Disadvantages -There are geothermal plants especially the older ones where the injection technology has not been implemented or upgraded where the residual water is released on the surface and causes contamination of the ground water. When waste water steam is sprayed over the surrounding vegetation or heavy metal laced waste water or hot water is released into the streams and lakes untreated, these have destructive ecological effects on sensitive species in their natural habitat. Subsidence – Slow downward sinking of land can be linked to the hydrothermal reservoir pressure decline. Injection technology (restoration of used water back into the reservoir via wells) reduces the occurrence of subsidence. Induced seismicity- Low magnitude events called micro-earthquakes are seen as a result of geothermal production and injection operations. These cannot be detected by humans, but they are voluntarily monitored by the facilities. Many geothermal resources do not have significant surface features and are discovered only by exploration. But sometimes natural surface features such as geysers ( hot springs where hot water steam and gas periodically erupt), fumaroles (vents for gas and steam) are indications for larger geothermal resources deep within the earth. There are fears that these surface features will be exploited for geothermal development. But scientific studies show that they cannot be a sustainable source for energy and hence are usually left undisturbed. Such areas may fall under protected zones, for e.g. the Yellowstone National Park with the famous geyser ‘Old faithful’. Active sites for geothermal sources are found in in areas with high scenic value (hot springs, volcanoes, glaciers). Building electric plants here disturbs the natural landscape with the presence of roads, power lines, factories, trucks and drilling equipment. This causes surface disturbance of the wilderness. Geothermal energy is a clean, continuous and sustainable energy resource. The exploration and setting up of geothermal plants are expensive procedures. There must be continuous development of technologies, which ensure that the effects of exploration and production do not harm the surroundings. Implementation of these technologies, in spite of the cost of doing so, can keep this resource going strong and help to reduce our dependence on other pollution causing resources.